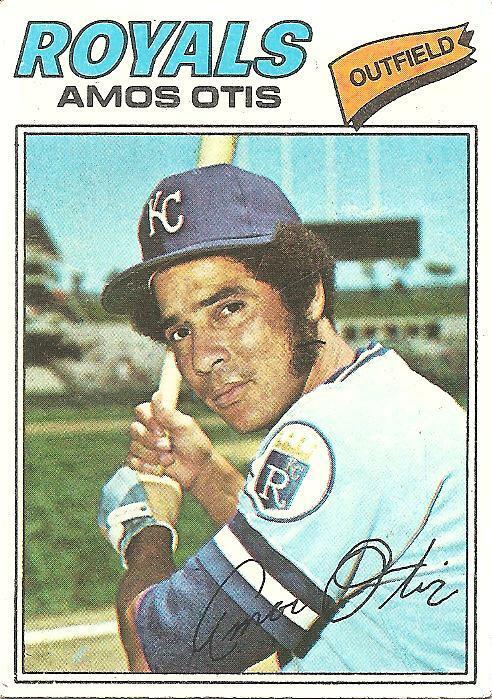 The Kansas City Royals have not been good for a long time, so when I first saw that this 1977 Amos Otis card was going to suggest the fortunes of the 2011 edition of the team, I figured it meant that, at long last, the team was finally going to begin changing from bad to good. Now, after giving the card and Amos Otis some more thought, I’m not so sure of that word: good. The numbers on the back of Amos Otis’s cards were always comforting to me. He was good. The numbers said so. He was not bad. He was not great. He was good. Otis, in light of all this, began to seem as if he might be beyond good. Very good? Great? What centerfielders had more of a positive impact throughout the 1970s? Cesar Cedeno, maybe? I know it’s arbitrary to block off a particular span of time and rank players within it, but I also know that for better or worse I pretty much live in the 1970s, so it’s important to me to know who in that era was bad, and who was good, and who was great. The funny thing is, I find myself as reluctant to move Amos Otis up a level from my long-held belief in him as good, exactly good, as I would be if called upon to move him down a level. For me, for whatever reason, Amos Otis has to be good. He was good way back when I began to discern good from bad, and I’m not talking just about numbers. There was something else I affixed to Amos Otis. I always felt drawn to him, as if he was a version of the person I wanted to be: solid, unassuming, good. Amos Otis, I believed, was good at baseball and just an all-around good person. Bill James notes in his appreciation of Otis that “about once a year or so it would break into the letters to the editor that he had been caught secretly performing some unusual act of good citizenship—stopping on the interstate to pick up a fan having car trouble or something.” I didn’t know about those letters to the editor, but there was something about Amos Otis as I knew him—almost entirely through baseball cards, that is—that communicated this goodness. Maybe it was his kid-friendly, slant-rhyming, cartoonish name, or his knack for blending politely into the background behind more spectacular talents such as George Brett and Hal McRae, or his mild, benevolent facial expressions, or his quietly groovy sideburns. All these things probably fed into my image of him—my faith in him—as an embodiment of good, but above all those things were his numbers. I already knew as a kid that some things were true and some things were false and most things fell into the hazy gap between the two, and to navigate or at least endure such an uncertain world I looked to the numbers. He made this revelation many years ago, but it was during a time when I wasn’t paying as much attention to baseball as I had previously or would again in later years, so I just found out about it now, this morning, while trying to move back toward my first beliefs about Amos Otis and the world. I’ve circled back around to baseball, and to Amos Otis, and I find that the numbers I thought would never change, that would stand as a singular still point in a world of change, have changed. I don’t even know if Amos Otis is good, but I still want to believe that he is. Eventually, you come to find there aren’t any absolutes. You take from this game what you need. You are currently browsing the archives for the Amos Otis category.